Can I use ClearID v2.x and ClearID v3.x on the same system? ClearID v3.0 can co-exist on a system with ClearID v2.x already installed, because v3.0 will only install into 64-bit versions of Adobe Photoshop and v2.x will only install into 32-bit versions. When using CID v3.x and CID v2.x on the same system you will need to re-load the appropriate CID action set from the Photoshop Actions panel flyout menu if/when switching between 32-bit & 64-bit versions of Photoshop. CID v3.0 and v2.6.4 are both installed on the same system, which has both the 32-bit and 64-bit versions of Photoshop CC installed. CID v2.6.4 was the last version used on the system, so the CID 2.6.4 actions were loaded and appear in actions panel of Photoshop CC for both the 32-bit and 64-bit versions of CC. 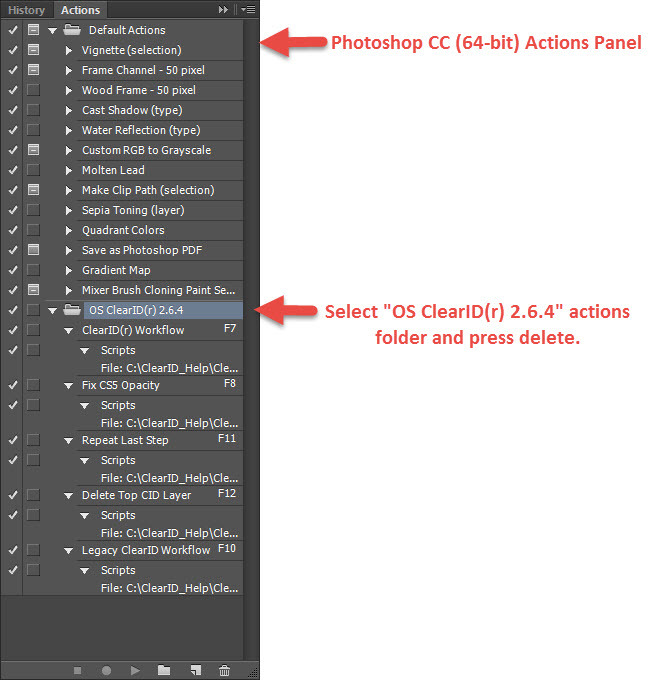 Note the “OS ClearID(r) 2.6.4” actions listed in the Actions panel, as shown below. 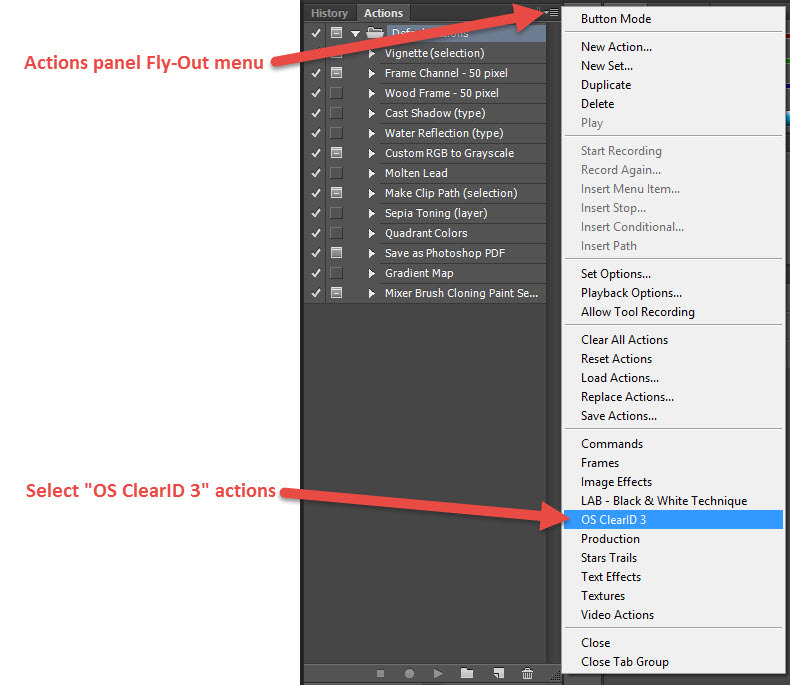 Click on the Actions panel fly-out menu and select “OS ClearID 3” to load the CID v3 actions. The CID v3 actions are now loaded in CC (64-bit) and ready for use. Should you go back to PS CC 32-bit you’ll notice the CID v3 actions appear in the Actions panel. In order to use CID v2.x you’ll need to repeat the process above, but this time select “OS ClearID(r) 2.6.4” actions (It will be the only CID action set listed in the 32-bit version).